I haven’t had a chance to bake as much since our little one arrived but now I’ve got a ring sling to wear him in I’m baking as much as possible! This recipe is quick, actually kind of healthy as its full of fruit, nuts and seeds and makes 2 cakes so what’s not to love?? I wanted to bake something to fuel us through the long sleepless nights and experimented with my best ever banana bread recipe to create a tasty and nutritious seeded coconut banana cake and my my it is delicious, especially warm from the oven. I’ve replaced the butter with coconut oil which works really well and adds a further coconut dimension to the cake. I love the nuttiness wholemeal flour brings to this bake too along with the sunflower and pumpkin seeds for an additional energy boost. They also look pretty baked into the top of the cake providing little green and golden flecks. I split this cake into 2 cake tins which means I can stash one in the freezer for a rainy day or unexpected guests. Just wrap it in tin foil and it will keep in the freezer for a month or two. ¤ 40g mixed seeds (or chopped nuts) sunflower, pumpkin, chia and sesame seeds; and walnuts, flaked almonds work well. 3. Mash the bananas first. Or if using a stand mixer throw them straight into the mixture and beat. Mix the bananas into the oil until combined. 4. Fold in the flour, baking powder, cinnamon and vanilla. 6. Pour the batter into the greased and lined cake tins. Smooth the top of the cakes with a spatula. 7. 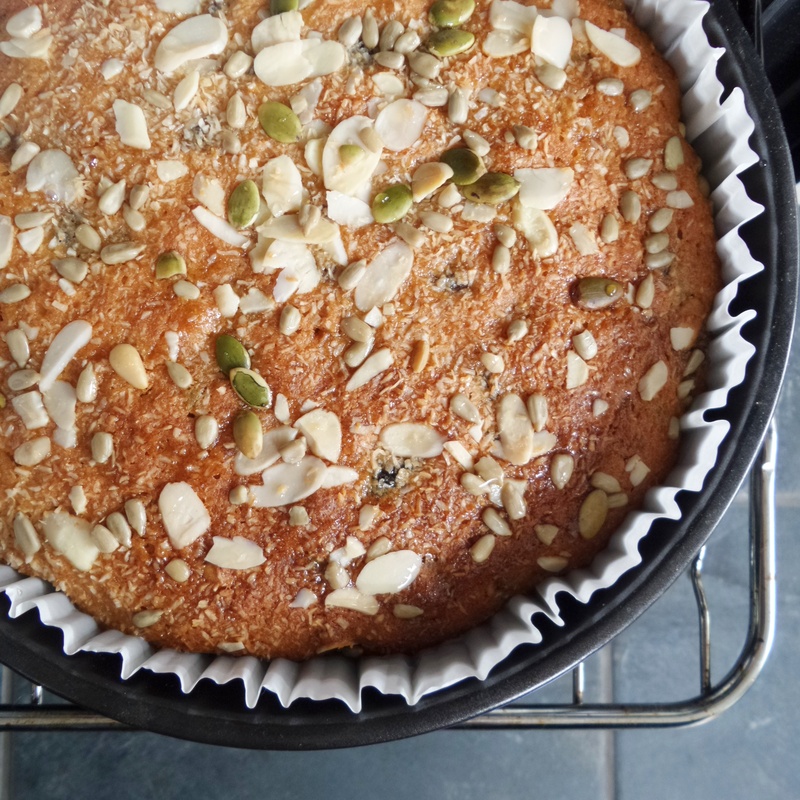 Sprinkle the tops of the cakes with a generous handful of mixed seeds and nuts. 8. Bake the cakes in the middle of the oven for 30-35 minutes and 160 degrees c. (Fan assisted) until golden brown and a skewer comes out clean. 9. Whilst the cakes are hot drizzle runny honey over the tops of the cakes and allow it to seep into the sponge. 10. Cut yourself a massive slice whilst still warm and shove it into your face whilst basking in the glow of baking yourself 2 cakes in one go. It’s even better washed down with a lovely cup of tea.